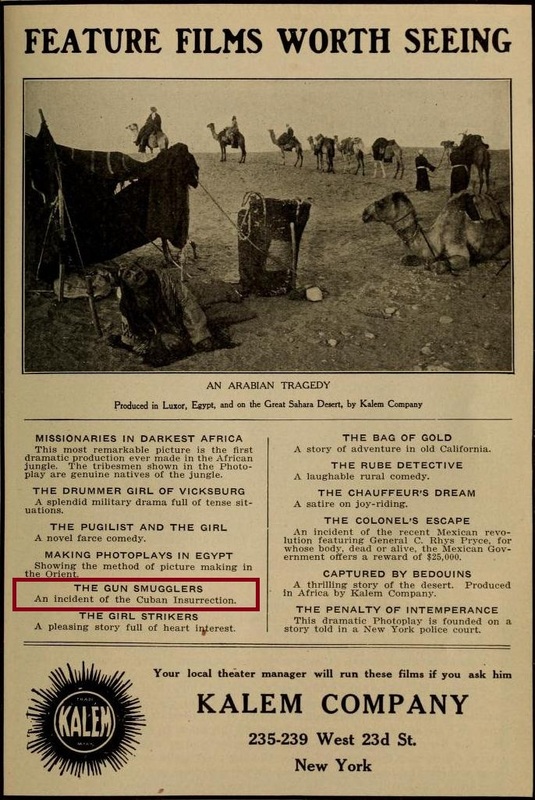 The Gun Smugglers filmada en 1912 por la Kalem tiene varios detalles curiosos, pues se vendió como una historia que sucede en la revolución mexicana y como un incidente acaecido en Cuba. Por otro lado, uno de los protagonistas, Carl Rhys Pryce, quien fuera oficial militar al servicio de los hermanos Flores Magón durante la toma de Tijuana en 1911, interpreta a Steven Jarrow, el contrabandista, en esta cinta. THE GUN SMUGGLERS (June 12).—Steven Jarrow, engaged in smuggling arms across the border, keeps the secret from his son, Logan. Valdez, the Mexican colonel, in charge of the Federal troops stationed there, has a very pretty daughter, with whom Logan is deeply in love. A gun smuggling expedition is planned. Federal headquarters receive warning and Colonel Valdez determines to annihilate the smugglers. During the action Logan’s father is killed and it devolves upon Col. Valdez to convey the sad news to Logan. The young man, not knowing of his father’s career, and believing his death was caused by unfair means, swears vengeance against his sweetheart’s father. However, he is saved from becoming a murderer by the cool-headedness of the brave colonel. John Bridge, one of the smugglers who managed to escape, is crazed by the death of his comrades and seeks to avenge them by taking the life of Colonel Valdez. Logan is arrested for the crime, but is cleared through the instrumentalitv of Bridge’s wife. 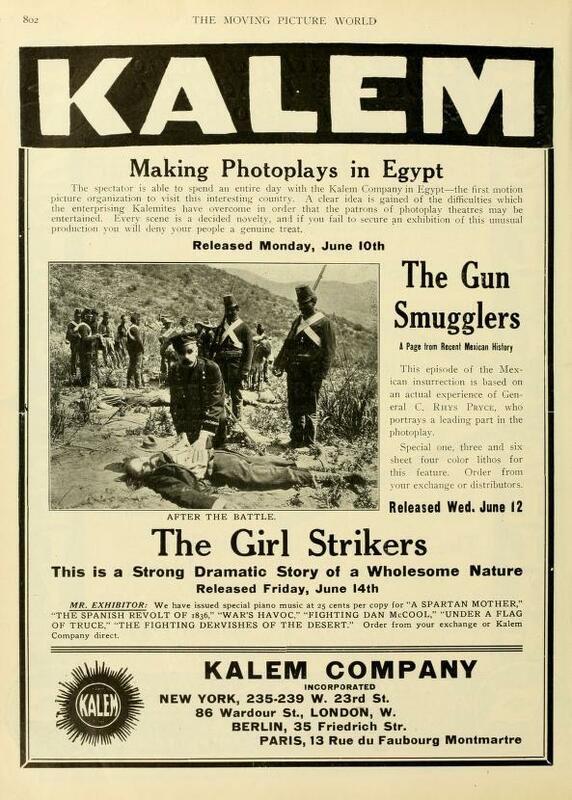 The Gun Smugglers (Kalem, June 12).–There are many strong, dramatic possibilities in this film, because the main situation is a particularly acute one but the producer has rather lost out on the dramatic end at least by not giving the story proper dramatic treatment either development or acting. The film, however, has its exciting moments in the struggle between the Mexican troops and the smugglers, and the producer has selected some very fine background in which to tell his story. The father, unknown to his son, is a gun smuggler. The son is in love with the colonel’s daughter who, when he receives notice of the work of the smugglers, sets out to capture them. In the ensuing fight, the young man’s father is killed. At the prison he is informed by his father’s accomplice that the colonel has killed his father. He determines upon revenge. One of the smugglers who has escaped is determined upon a like revenge. The young man appears before the colonel before the other, is overcome, and dissuaded from his purpose. After he leaves the smuggler arrives, and kills the colonel. The young man is blamed for the crime, though it is not altogether clear just how the evidence is placed upon him from the way the story is told. The wife of the murderer appears before the authorities and confesses the truth of her husband’s crime, and thus frees the young man. “THE GUN SMUGGLERS” (Kalem), June 12.—In this drama of the Mexican rebellion, there is a good plot and some lively skirmishing. Carlyle Blackwell takes the leading part. His work and that of the leading characters is well done. Notable among others are the crazed smuggler and his wife and the Mexican colonel. Resulta extraño que la revista mensual The Motion Picture Story Magazine publica un anuncio de la Kalem donde The Gun Smugglers se anuncia como una aventura que sucede en Cuba en lugar de México. ¿A qué se debe este cambio? ¿Hubo algún elemento político para ello? De haberlo, ¿fue del gobierno federal norteamericano o quejas del sistema consular mexicano? Hago estas preguntas, porque no hay duda que es la misma película, dada la fecha de estreno: 12 de junio de 1912. También puede suceder que fue un error de los publicistas de la Kalem, pues no dudo que para muchos de ellos Cuba y México eran lo mismo: Sudamérica. Subtitled: “An incident of the Mexican Rebellion.” Much of this film suffers from very heavy deterioration, making it nearly unwatchable in parts. At least one crucial scene is missing. This contributes to the confusion in the plot, since it is now not apparent that the mysterious man in the cabin kills Colonel Valdez, and accounts for Joyce’s apparently inexplicable sadness at the end of the film when reunited with her lover. The handsome Carlyle Blackwell plays the lead. Joyce looks picturesque in her dark frilly gown, with her hair down and a flower in it.